Tim – I remember when this happened back in 2013. It was all over news and social media. Watching this trailer makes me cry a little. 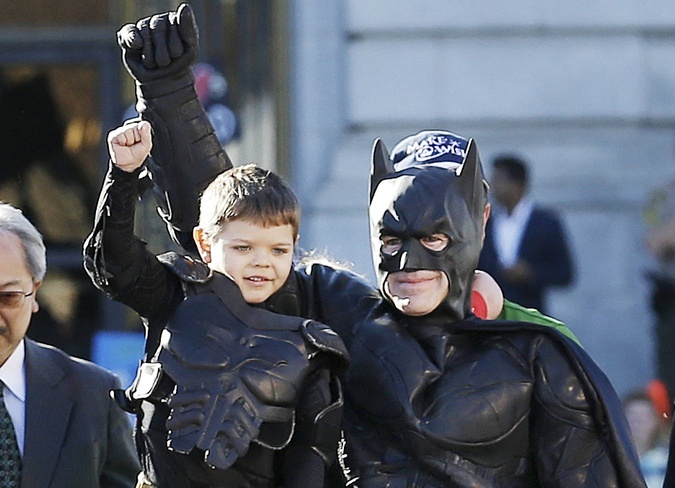 The story about the little boy who got to be Batkid is very touching, but more so is the story about a city (and, really, people all over) coming together for a common good. The news is usually full of trash, so it’s great to see that, at their core, most people are actually good. There are a lot of neat things happening to deserving people all of the time, so some might ask, “Why make a movie about this one?” But if it helps us to be reminded of the good in us, it’s worth it. Trevor – Looks pretty good. The news story that went viral when this happened was awesome; it’ll be cool to see more. I don’t need to see it in theaters, but I’ll definitely watch this on Netflix. Cool story. I wish we could have more cool stuff like this happen. Nate – This gave me the chills. I cannot wait to see this movie, and I sure hope it comes to Megaplex! This is why I am building a Rex armor set; the look on that kids face just made my night! It helps everyone, not just him! I saw this all over social media, so I can’t wait to see how it all happened. Tim – I like a good horror comedy every now and then, but they have to be seen with friends. Probably late at night. This movie has a good cast, and I like that the kids are the monsters… cuz guess what? Kids are monsters. I doubt I’ll ever see this. Nothing really stands out that makes it look special or unique enough. Maybe a Redbox rental when we’ve ran out of other things to do. Trevor – Ok, this show looks awful. What’s the demographic? It’s not for kids, but is about kids… But more specifically killing the kid zombies. This show looks messed up. Nate – This looks pretty funny, and I hope that’s what it’s supposed to be. I have said before I really enjoyed “Shaun of the Dead,” so I’m looking forward to this one! Not really much else to say other than that I am excited for this one. Tim – You know those straight to DVD knock-offs of major box office movies? Like Transmorphers when the Transformers movies were coming out? Or Atlantic Rim or Apocalypse Z? This feels like that. A poor man’s version of the Avengers, except it’s DC characters on a TV series. Now, I’m not talking about the characters themselves. DC & Marvel have been riffing on versions of each other’s characters since the beginning. No. I’m talking about the dead-on-arrival humor, the B-tier action, the lower budget effects, and the hyper cheesy dialogue. Forget this. Give me another season of Daredevil. Trevor – I really want this show to work, but I’m not positive that we NEED this right now. I hope it’s not too much alongside Arrow and the Flash AND Supergirl. I’ll give it a shot, but honestly we’re getting really campy and I’m just skeptical. Nate – This looks cool! I’ve never been a huge DC guy, and of course I’ll draw parallels to marvel and what they’re doing. But hey, it looks entertaining! I love superheroes and this looks like it has a lot of potential. So bring it on, DC!